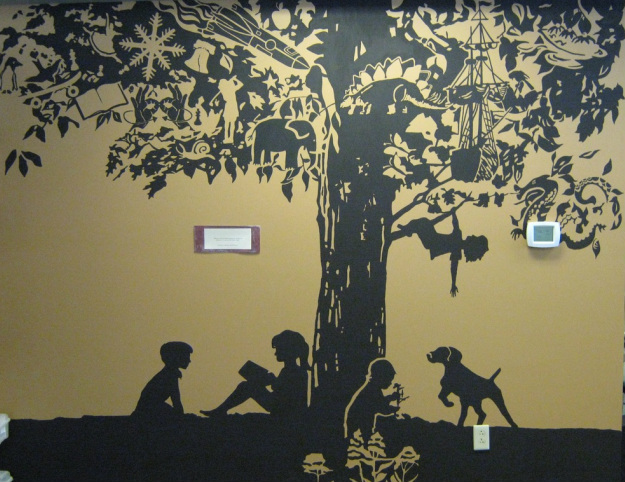 This mural was designed and completed in 2009 for the Hamlin Memorial Library's children's wing. The mural was to serve a dual purpose of being a decorative element and as a way to recognize the Robert Digel Family. The final design offers young patrons a treasure hunt of non-fiction topics while quietly acknowledging Mr. and Mrs. Digel's four children and their hunting dog as well. The Roots and Wings mural has become an asset to the library and its bold design is now included as a brand logo for the library and has been used on bookplates, T-shirts, posters and letterhead.